Chelsea boss Maurizio Sarri is set for his first major outing as Blues boss as he prepares his side to face Man City for the Community Shield. The Italian tactician was appointed as Chelsea boss just last month as he replaced Antonio Conte at Stamford Bridge. Given that their respective approaches differ significantly with Sarri preferring a more expansive and high tempo game, it will have been difficult for him to implement his style entirely and get across what he wants from his team in such a short space of time. Nevertheless, there have been positive signs in pre-season and a win over City could be a real morale boost for Chelsea ahead of the new Premier League campaign. 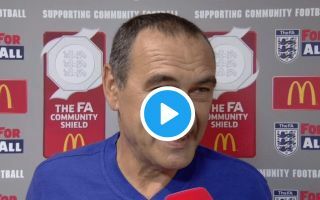 Speaking to BT Sport ahead of kick-off, as seen in the video below, Sarri revealed that he spoke with Pep Guardiola over the summer and the Spaniard’s advice to him was that the English top flight is ‘hard’ but the challenge is ‘very exciting’. Further, while praising summer signing Jorginho, who will be key to getting Chelsea to tick in the heart of the midfield with his vision and technical quality, Sarri also bemoaned the absence of key individuals following the World Cup as he hasn’t had a chance to work with them ahead of his first season in charge. Time will tell if they are able to hit the ground running or not when they return, but for now, Sarri will hope the players at his disposal on Sunday are enough to see off Man City.